One of the world's most renowned chefs and culinary mentors, Alain Ducasse has been awarded 18 Michelin stars over his career, and has owned 23 restaurants. The master chef allowed to be followed by a camera for two years, the result of which is a delectable documentary screened this year in Berlin. 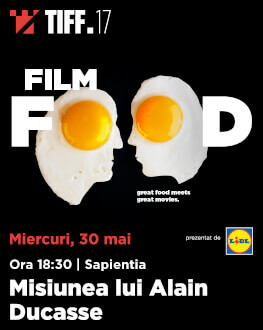 The film will be followed by a surprise dinner cooked by Florin Dumitrescu, one of the most beloved chefs in Romania. He started cooking professionally at the age of 18, and in his over 12 years of kitchen experience, he prepared meals for celebrities like Nicolas Cage, Roger Federer, Wesley Snipes, Francis Ford Coppola, or Jean-Claude Van Damme. On May 30th, starting 8 pm, he will offer a special gastronomical experience at TIFF.